Lexan is a tough polycarbonate resin thermoplastic used in a wide range of applications, such as in high performance windshields, car headlights, eyeglass lenses, bullet proof "glass" and in panels used to construct greenhouses. Like safety glass, it's designed to be stronger and more durable than ordinary glass. However, while it has several advantages over safety glass, Lexan windows have some disadvantages as well. Safety glass doesn't shatter like "normal" glass. Safety glass is more durable than Lexan, which only has a lifespan of around 15 years. Although Lexan is resistant to ultraviolet light, water, flame, and temperatures as high as 212 degrees Fahrenheit and as low as minus 40 degrees, it will eventually yellow, causing a reduction in the amount of light that's transmitted through it. The manufacturer does offer a limited 10-year warranty against excessive yellowing and loss of light. The qualities that make Lexan flexible and strong also give it a soft surface that's prone to scratching. Special coatings can be applied to Lexan to make it more resistant to yellowing and scratching. However, over time, the coating tends to delaminate. In addition, the coating itself is susceptible to scratching and the coating will wear off if you rub it in an attempt to clean it. Glass, on the other hand, being a hard material, is resistant to scratching. Lexan is an extremely strong material that is almost unbreakable. Safety glass is not as strong. Tempered safety glass has an impact strength that's five times higher than "normal" annealed glass of the same thickness, while Lexan has an impact strength that's 250 times that of annealed glass. Because Lexan is so strong, it can also be manufactured into thinner sheets that don't weigh as much as safety glass. Lexan is easy to cut with a circular saw or a reciprocating saw. Use a blade with triple chip ground teeth to reduce chipping. Safety glass can't be cut or drilled, so you need to know what shape and size glass you'll be using before the glass is processed. 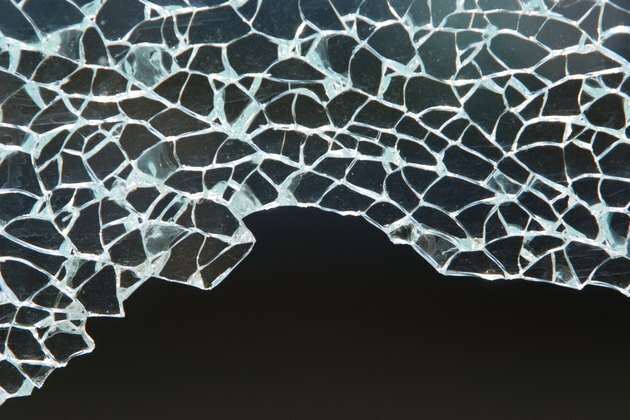 Safety glass may also contain warps and other distortions that occur when it's treated with heat. This can affect the optics. Tempered glass costs less than Lexan. At the time of publication, you could purchase an 8-by-10 inch piece of clear tempered glass for around $18, while an 8-by-10 sheet of Lexan cost about $35. Another consideration, especially if you're looking for glass for a greenhouse, involves the ability of safety glass and Lexan to transmit light. Plants prefer full-spectrum light, but safety glass does not allow the full light spectrum to pass through it while Lexan does. What Chemicals Are Used in Glass Cleaners? What Kind of Glass Is Used in Oven Doors?